The short story “Call of Cthulhu” first appeared in 1928, in an issue ofWeird Tales, the pulp magazine familiar to every reader of horror fiction. This was a time when Westerners were just beginning to be exposed to the exoticism and sensuality of life in the tropical seas, and also to the barbarity of the pagan cultures found there. 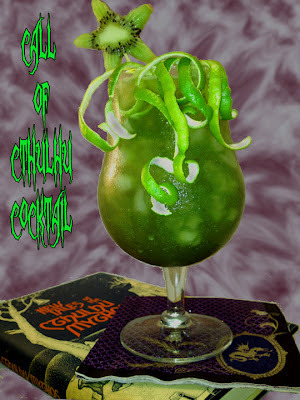 We based the drink on the tropical grogs of those climes, with plenty of fresh citrus and three kinds of decadent rum. Its structure is also a nod to Don the Beachcomber’s original Zombie, a name that conjures visions of helpless humans trapped in a spell of forgetfulness and servitude. The maraschino liqueur adds a whiff of dusty forbidden tomes. To facilitate disturbing dreams, we included Strega, the ultimate Witch liqueur from a site in Italy originally known as Malevento – the place of evil events. The blue Curacao is essential; do not even consider replacing it or the gods may be disturbed and awakened prematurely; when you look at the finished result of our mixology, you’ll understand why you must adhere to the recipe. Finally, we had to add the Madness From the Sea, and so a sprinkling of brine is called for in the presentation of the drink. Here are detailed instructions on how to make it. They war would-be cultists not once but twice that this drink is not for the faint of heart (or liver), so consume at your own risk. Thanks for publishing this... we worked hard to develop a drink worthy of the name..... and it came out a wonderful sickly green quite by accident or was it????? It is a potent as it's namesake so have fun. This is an excellent post i seen. I have to thanks to you to share it. It is really what I wanted to see hope in future you will continue for sharing such a excellent post. OOH advertisement ERP offer their own particular uncommon effect – sheets, dividers, transport and rail media, road furniture, quality signage, motorized, adaptable declarations, sports media and that is only the tip of the ice sheet – that are certain to fit your needs. Their clearing portfolio joined with our main degrees offer an unparalleled increment by business division than some other out-of-home media seller. What an creative idea! Love it! !